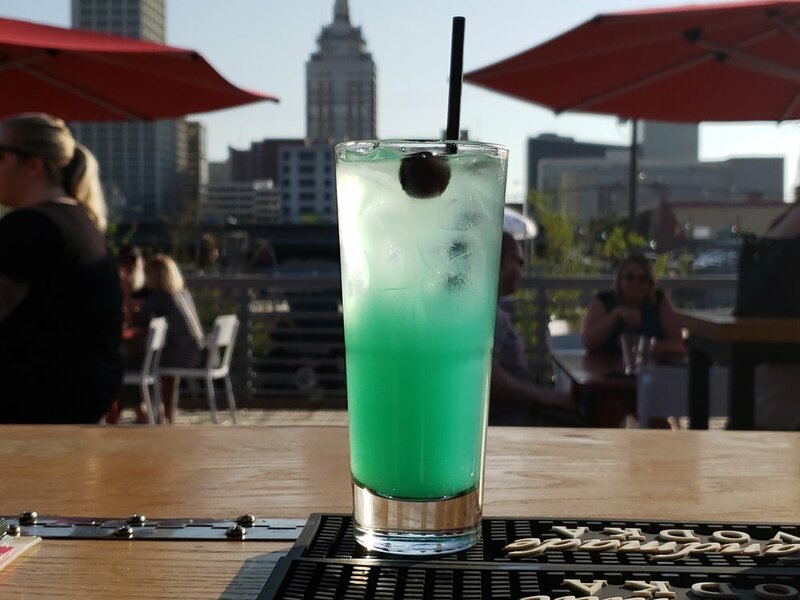 Located in The Boxyard, Open Container is THE spot for great drinks, delicious food, and a gorgeous view of downtown. Open Container was established in February of 2017 by the Topeca Coffee Company. Hodges Bend and The Saturn room being the (big) sister bars. The OC focuses on classic (and classics with a spin) cocktails, local beers, and top-notch bar food. All set in an awesome atmosphere! With the new patio roof being built in December Open Container is about to be a year-round spot for all. There is already seating inside the bar and restaurant containers, with the restaurant being available to all ages, to keep cosy. The summertime brings steady crowds during happy hour and in the evening during the week, and high volume crowds on the weekend evenings. With the awning system, we hope to continue the summer trend through the Oklahoma winters. We also have hot cocktails, blankets, and plenty of spirits to keep you warm. The OC started serving food in June of 2018. It is quality bar food and snacks. The Star of the show being the chicken. The Nashville HOT chicken sandwich and the fingers have gotten rave reviews from our customers. We also offer 100% angus beef burgers and Nathan’s hot dogs available with our topping or as a build your own. We have rotating specials monthly and a happy hour everyday from 4p-7p. The Open Container and The Boxyard frequently have a wide range of events and entertainment. The OC patio, the patio adjacent to the OC, and the “event containers” are all available to reserve for almost any occasion. Contact Melody via The Boxyard Website. Our patio is enclosed, warm, and ready! come check out our new and improved space! "Food is good for the nerves and the spirit. Courage comes from the belly "
for to go orders Call (918) 895–5016 during our open hours or order online with GrubHub. Hurricanes…..check. Beads…..check. Sazeracs…..check. Cajun food…..check. You and your friends?…..TBD. All we need is you and your crew and we got a party!!!!! Do we really need to explain this wonderful holiday? Wear green, drink green beer, drink jameson, and finish with an Irish Car Bomb. (All drinks pair well with regret & a mixture of pedialyte and water) Drink responisbly or we’ll call your parents!